A couple years ago during my ill-fated return to higher learning, when homework and misery went hand-in-hand, I kept having recurring fantasies of driving away. That’s it. Just getting in a car and driving…away. I would listen to Little Boots’ “Motorway” and drift off to images of mindlessly cruising the Trans-Canada Highway, all 5,000 miles of it, just cutting out and going. Going where exactly? Well, that’s where the fantasy ended. I had no destination; just the white lines of the highway rolling on and on. I always figured there was no end point in the dream because once you reached Wherever it would be exactly like Everywhere Else. 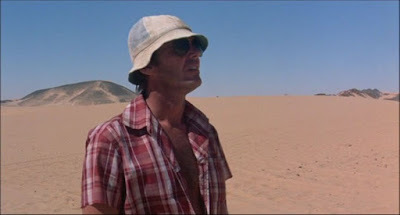 As Michelangelo Antonioni’s “The Passenger” opens, journalist David Locke (Jack Nicholson) is in North Africa, trying to make contact with rebel fighters who are reputedly in the desert hills. He has no luck. Few words are spoken as he stumbles around a mostly empty town, offering cigarettes to anyone who’ll have who tell him nothing. When he finally seems to have made inroads, he hasn’t, getting stranded in the Saharan desert when his jeep gets stuck in the sand. He gets out by walking out, tired, sweaty, sunburned, disgusted, done. What kind of life is this? Apparently none it all. Once back at his primitive hotel, he finds the establishment’s other guest, David Robertson (Charles Mulvehill), an Englishman with whom Locke got drunk the previous evening, lying on his bed, dead. Without explanation or even the slightest inkling of contemplation, Locke goes about assuming Robertson’s identity, changing out ID and telling the hotel that David Locke is dead. He insinuates himself into Robertson’s loner life by leaning on a planner filled with names and times on specific dates. Eventually it is revealed that Robertson’s business involved gun-running, which seems readymade for action and suspense, but this is primarily tangential, as is the story back home in London where Locke’s wife (Jenny Runacre) wonders what really happened and sends their mutual friend Martin (Ian Hendry) to find out. This leads to Locke evading both the authorities and the people from his previous life. Locke’s co-conspirator becomes a girl played by Maria Schneider. She helps him out of a jam and then tags along. She is never given a name. She is as rootless as Locke wants to be. He keeps asking her why she’s along for the ride and she never really answers. The life she has walked out on is never made clear, perhaps because she would rather let it lie there. Like this stranger who intrigues her, she presses forward toward something, though who knows what. When she asks him what he’s running away from, he answers by telling her to turn her back to the front seat. She does. She sees the road receding. That’s good enough. What they’re moving toward is of no interest to camera. Maybe it’s of no interest to them. There is a strange detachment throughout to Nicholson’s performance. Not just in the early sequences cluing us into his emotional malaise, but once we assumes Robertson’s identity. This swapping of selves would at first seem born of a desperation for something new, something different, something exciting. After all, in brief flashback to his conversation with Robertson, Locke notes the gloom that comes with a person’s formation of habits, live lived out in the same manner day after day, year after year. 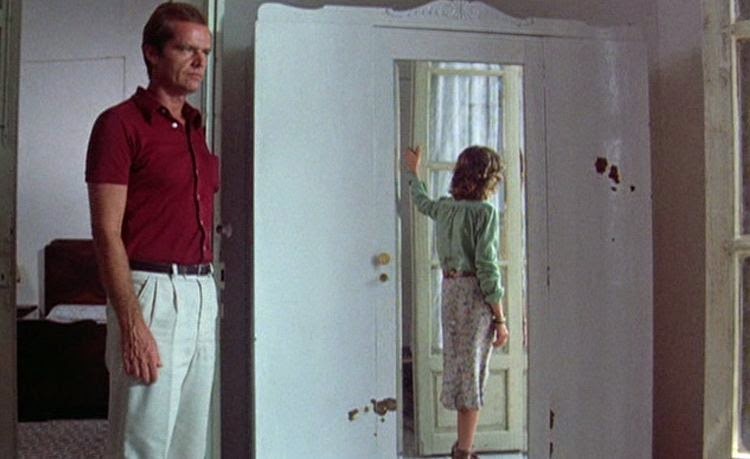 Yet even as someone else, even as someone caught up in illegalities and clandestine meetings, like something straight out of a spy novel, Nicholson gives the part no jolt and Antonioni keeps the film’s energy muted. Whatever Locke hoped to get from this ID switch, he doesn’t, life still drags on, and the past he wanted to toss in the incinerator is still snapping at his heels. We’re all just passengers in our own lives, I suppose, gazing out the window as the scenery rolls by. And that is the most affecting visual motif in “The Passenger”, peering through the window. Over and over we see characters peering through the window or the camera itself, which often feels like a secondary character, the documentarian documenting this journo’s gradual untethering from the world. At one point, Robertson (Locke?) and the Girl sit in a seaside restaurant, chatting, drinking, eating, and he notices a woman out the window sitting in the sun. It’s as if he’s imagining who she is, what her life encompasses. Even here, in this idyll setting, he’s looking out the window, fantasizing about something else. These recurring shots build gracefully to the film’s conclusion, as intoxicating a wrap-up in the medium as I’ve seen, unveiled in a seemingly unbroken take that begins in Locke/Robertson’s hotel room and then pushes out a window, a window lined with bars, evoking the prison cell to which he’s confined himself, and then drifts through those bars and into the piazza where the police and the people looking for Robertson/Locke descend upon his hotel room. As they do, the camera subtly pivots and floats back toward the room from which just exited, now looking into the window rather than out of it, the promise of what’s out there no longer beckoning, nothing left but what’s already in here.